A natural gas-dominated electricity system would continue to heat up the planet. Why are coal-fired power plants closing? An increasing number of old and inefficient coal plants are no longer able to compete with cleaner, more cost-effective energy sources such as natural gas and wind power. Over the coming decades, as more coal plants reach the ends of their lifespans and are retired, they will likely be replaced by more cost-competitive energy sources. Why is nuclear power projected to decline so dramatically? Nuclear power is expected to drop significantly over the coming decades as existing nuclear plants reach the ends of their lifetimes and are retired. Few new U.S. nuclear plants are expected to come online in the future, in large part because nuclear power is not currently economically competitive with other energy sources. Why is natural gas expected to provide the majority of U.S. electricity by 2050? Domestic supplies of natural gas have increased dramatically in recent years, due in large part to the development and expansion of hydraulic fracturing (fracking) drilling techniques. This increased supply – which is expected to continue for years – has lowered prices for natural gas, making it very cost-competitive compared to other energy sources. Natural gas burns cleaner than coal, so why don’t carbon emissions decline with a natural gas-dominated electricity system? Compared to coal, natural gas produces approximately half of the carbon emissions per unit of electricity generated. But natural gas is expected to replace not just declining coal power in the future, but also a significant portion of low-carbon nuclear power. Electricity demand is also projected to rise nearly 30 percent from 2012 to 2050 – increasing from 4,054 to 5,222 Terrawatt-hours. Much of the additional needed electricity is projected to come from natural gas, creating more emissions in the process. To effectively address climate change, how much do we need to reduce emissions from the electricity sector? The electric power sector is the largest contributor to U.S. global warming emissions and currently accounts for approximately one-third of the nation's total emissions. To limit some of the worst consequences of climate change, the National Research Council (NRC) recommends an economy-wide carbon budget that would cut U.S. power sector carbon emissions 90 percent from current levels by 2050. The electricity sector has a range of low- and zero-carbon technologies that could contribute to this carbon budget including energy efficiency, renewable energy, nuclear power, and coal or natural gas plants with carbon capture and storage (CCS). However, UCS analysis shows that scenarios including high levels of CCS and nuclear power for reducing emissions are more expensive than scenarios that rely on energy efficiency and renewables. Learn more. 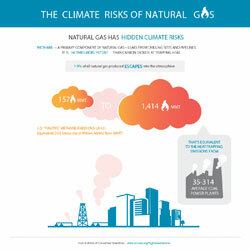 Are there additional climate risks associated with natural gas? Yes. Methane – a primary component of natural gas – leaks from drilling sites and pipelines. It is 34 times more potent than carbon dioxide at trapping heat. An estimated one to nine percent of all natural gas produced escapes into the atmosphere, equivalent to the global warming emissions from 35 – 314 typical-sized coal power plants (600 megawatts). This methane leakage poses additional climate risks and erodes the climate benefits of replacing coal with natural gas. Learn more. Can renewables realistically provide more than 80% of U.S. electricity? Absolutely. A comprehensive study by the Department of Energy’s National Renewable Energy Laboratory has demonstrated that currently available renewable technologies could affordably and reliably provide 80 percent of U.S. electricity needs by 2050. How can the U.S. make progress toward a renewable energy future? Invest in improved energy storage technologies such as advanced batteries, pumped hydro, and thermal storage. Learn more about the methodology and assumptions behind the infographic. You are free to use and post this infographic without alterations online, in written materials, and in presentations. Any online use must include proper citation and a link to this web page. Learn about the climate risks of natural gas leaks from drilling sites, processing plants, storage facilities, and pipelines.